Uluru, Australia. 19 Apr. 2011. Personal photograph by author. JPEG file. The van faded over to the left and pulled in slowly to the viewing site, leaving a cloud of red dust behind it. We all piled out, stretched in the desert embrace, and caught our first glimpse of the hulking rock. It seemed to rise up out of nowhere, an incredible power in the midst of a barren expanse. I knew even from a distance that I could not begin to understand the depth of this sacred land. The rock that sparked my deep curiosity is known by two names. 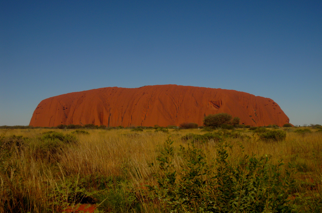 Indigenous people of the Central Australian desert- the Anangu- have always called the rock Uluru. Surveyor William Gosse named it Ayers Rock in 1873. The distinction between these two names is a small piece of the larger claims of legal possession at Uluru and touches on, “the imperial idea that all before the explorer was new and everything he saw was at once British territory.” (Barnes 164). The possession of this sacred land has brought up many issues. Climbing Uluru is one of the most modern and controversial issues. The rock is a major tourist attraction and a chain handhold added in 1964 and extended in 1976, made the climb more accessible. Uluru is a very sacred center of the Anangu people and traditions. The term “Tjukurpa” is the all encompassing aboriginal view of life. Tjukurpa includes law, religion, past, present, and future, relationship with the land, the creation period, and the interconnection of it all. “Tjukurpa as law establishes an indigenous terrain of power that both names the rock as Uluru and identifies socially infused biophysical processes, allowing them to read Dreaming tracks of their peoples on the rock face.” (Waitt 253) Aboriginal stories contain complex explanations of creation and the specific sites associated with these stories are very significant. In the cultural center of Uluru, visitors can spend hours reading myths associated with the rock. Every scar, mark, or coloration on the rock has a story to it and with every story there is a cultural message. The climb is particularly disrespectful of tradition because the route follows the traditional path taken by the Mala men during their initiation rites (McKercher 375). The Mala people were the ancestral Anangu people who lived around Uluru. The climb is sacred for the ancestry of the Anangu as an initiation rite and it is not taken lightly. Uluru has always been sacred to the Anangu, but it became central to the entire country of Australia in the 20th century. In 1929 Australian National Travel Association formed. The ANTA launched a “Home is Best” campaign to celebrate inland development in Australia. In the process, it, “not only intellectually and materially constructed one grand pilgrimage site at The Centre of the continent at Uluru, but also played a significant role in the dispossession of local Aboriginal people- Anangu- of their ancestral homeland.”(Barnes 150). This pilgrimage site at the center of Australia drew in tourists from all over the world and romanticized the journey to Australia. Since being opened to tourism in the 1950s, Uluru has come to symbolize the heart of the Australian nation. This boom of tourism marked the beginning of a disagreement over control and access to this site between settler Australians, who wished to photograph and climb it, and the Anangu, to whom it is sacred. “That visitors still climb Uluru could be seen as evidence that this site continues to symbolize a split between settler and Aboriginal Australian concepts of place and appropriate actions in relation to Uluru.” (James 402). Uluru, or Ayers Rock, is now seen as central to not only the Anangu traditions, but also Australian tourism. From the tourism boom in the 1950’s onward, Uluru was the talk of Australia. It became a New Age pilgrimage site and was not to be missed by the Australian tourists. There was a lack of education and connection to the original people of the land and Anangu people were infuriated by the tourist use of Uluru. On 11 December 1983, Prime Minister Bob Hawke promised to hand back the land title to the Anangu traditional owners and agreed to the community’s 10-point plan which included forbidding the climbing of Uluru. However, the government set access to climb Uluru and a 99-year lease, instead of the previously agreed upon 50-year lease, as conditions before the title was officially given back to the Anangu. (James 401). The official ‘Handback’ ceremony was held in 1985. The Handback startled the settler nation who viewed this as a loss of access for tourists, but the almost century long lease and the fine details of the Handback made the possession of Uluru remain split. The Anangu and Parks Australia manage the Park jointly. Tjukurpa provides guiding principles for its management. The co-management model has allowed the traditional owners to close a number of sacred sites and has given them a direct role in approving or denying various activities proposed for the park. However, the climb remains the most controversial management issue. Park management strongly encourages visitors to stop by the Cultural Center first. The center teaches about Anangu culture and Tjukurpa. At the cultural center, Tony Tjamiwa, the senior Anangu traditional owner of Uluru says that. 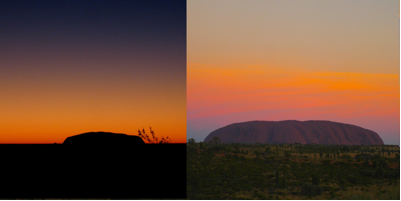 “Now a lot of visitors are only looking at the sunset and climbing Uluru. That rock is a really important sacred thing. You shouldn’t climb it! Climbing is not a proper part of this place. There is a true story to be properly understood. The real thing is listening to everything. Listening and understanding everything. We are informing you: don’t climb. And maybe that makes you a bit sad. But anyway, that’s what we have to say. This is the proper way: No Climbing.”(Thost 12). Tjamiwa makes a direct plea to the visitors to listen and respect the tradition. The Anangu people also list several reasons not to climb in addition to their cultural reasons. There is a great concern for safety with the climb because many people have died. The visitors guide states, “Traditionally we have a responsibility to teach and safeguard visitors to our land. The climb can be dangerous and over 35 people have died while attempting to climb Uluru – many others have been injured. We feel great sadness when a person dies or is hurt on our land.” (Wiatt 256). The park rangers are also greatly concerned for visitor safety and stress the dangers of the strenuous climb. There are many environmental reasons to close the climb that the Anangu have presented. The path of the climb has smoothed the rock from thousands of footsteps. This erosion is changing the face of Uluru. There is also an issue of pollution and waste left by people who climb. Trash left on the climb can be washed off the rock with rain into waterholes that native reptiles, birds, animals and frogs rely on for habitat and nourishment. “Water quality tests have found significantly higher bacterial levels in the waterholes fed by runoff from the climb site compared to waterholes further away.” (Tenbrunsel 14) These water holes are sacred to the Anangu and central to the native life of Uluru. The environmental damage represents the ripples of negative effects that the climb has on Uluru. The park rangers are an example of a non-native perspective discouraging the climb. They are concerned for the safety of visitors and respect the Anangu. Other non-natives, especially tourists may not have the same concern and respect. The reasons of why to not climb are clearly outlined by the Anangu people, but the reasons to climb vary on a case-by-case basis. In 1998, John and Lee Ross conducted a study using a qualitative research framework to examine how people justify their decision to climb Uluru. Their study combined with tourist blog analysis and other conducted certified identified eight thematic narratives explaining why people climb. “At one extreme, some climbers expressed overt rejection of the legitimacy of Aboriginal values, while at the other extreme, climbers saw it as a realization of a personal quest. The middle groups felt their status as tourists permitted the activity. Some of these themes align closely with neutralization techniques, while others do not.” (McKercher 377). The variety of reasons for climbing display a range of feelings towards aboriginal cultural and the importance of the climb. The climb is a very sensitive feature of Uluru tourism. Although the climb is strongly discouraged, it has yet to be banned completely. The officials feel uneasy about the cultural implications of the climb and nervous about the potential dangers, and as a direct result the climb is closed frequently. In the visitors guide it is laid out explicitly that the climb will be closed, “with little or no notice for: HEAT- if the actually temperature reaches 36°C or above, RAIN- when there is greater than 20% chance of rain within three hours, RAIN- when there is greater than 5% chance of thunderstorms within three hours, WIND- if the estimated wind speed at the summit reaches 25 knots or above, WET- when more than 20% if the rock surface is wet after rain, CLOUD- when cloud descends below the summit, RESCUE- during rock rescue operations, CULTURE- if the traditional owners request closure for cultural reasons, for example during a period of mourning.” (“Palya!…” 15). With over 35 deaths and pleas of respect and restraint from culture of people who have known this land longer than we can imagine, it appears that the officials will jump at any reason to close the controversial climb. So then why haven’t they just closed the climb entirely? What are they waiting for? When will they finally give the Anangu people the respect they deserve and hand over Uluru entirely? In 1983, when the Prime Minister promised to hand back the land title to the Anangu, progress was made, but it’s not enough. Why should the Anangu have to wait for Uluru to milk its last years of tourist climbing? Originally it was agreed upon that the government set a 50-year lease, but then that got changed to a 99-year lease. This seems incredibly arbitrary and projects such a false image of compassion. Here, you can have your land back! Wait a second, not yet, how about another 99 years of tourists climbing all over it first? Yes, that sounds fair and reasonable. When I visited Uluru in 2011 I was with a group that I had been traveling with for three months. As a group, we all discussed our personal opinions on the climb and factors affecting our decisions. A common theme of our discussion was ownership of the land. How can anyone- native or non-native claim ownership or rights over the land? The earth is not just a dead thing you can claim. When given the chance to decide whether or not to climb, I tried to see both sides of the argument. I understood and felt the appeal of the challenge that the climb presented, but it wasn’t enough. I couldn’t rightfully decide to climb because I can’t understand what the climb means to the Anangu. Barnes, Jillian. “Tourism’s role in the struggle for the intellectual and material possession of ‘The Centre’ of Australia at Uluru, 1929–2011.” Journal of Toursim History 3.2 (2011): 147-176. EBSCOhost. Web. 2 Nov. 2012. James, Sarah. “Constructing the Climb: Visitor Decision-making at Uluru Constructing the Climb: Visitor Decision-making at Uluru.” Centre for Cultural Research, University of Western Sydney 31 (2007): 398-407. EBSCOhost. Web. 2 Nov. 2012. McKercher, Bob, Karin Weber, and Hilary du Cros. “Rationalising inappropriate Behaviour at Contested Sites.” Journal of Sustainable Tourism 16.4 (2008): 369-385. EBSCOhost. Web. 2 Nov. 2012. “Palya! Welcome to Anangu land.” Uluru-Kata Tjuta National Park Visitor Guide. Australian Government Director of National Parks, n.d. Web. 2 Nov. 2012. <www.environment.gov.au/parks/publications/uluru/pubs/visitor-guide.pdf>. Tenbrunsel, Ann, Kimberly Wade-Benzoni, Leigh Tost, Victoria Medvec, Leigh Thompson, and Max Bazerman. “The Reality and Myth of Sacred Issues in Negotiations.” Negotiation and Conflict Management Research 2.3 (2009): 263-284. EBSCOhost. Web. 2 Nov. 2012. Waitt, Gordon, Robert Figuera, and Lana McGee. “Fissures in the rock: rethinking pride and shame in the moral terrains of Uluru.” Transactions of the Institute of British Geographers 32 (2007): 248-263. EBSCOhost. Web. 2 Nov. 2012. I respect the traditional owners like a respect the Italians that built St. Peter’s Basilica. It wouldn’t stop me climbing to the top of either of these again.